World Autism Awareness Day, Light it Up Blue logo. One in every 68 children born in the United States will be diagnosed with an Autism Spectrum Disorder (ASD). Autism is a neurologically based developmental disorder that affects a individual’s ability to communicate, socially interact, and engage in developmentally appropriate behaviors. World Autism Awareness Day kicks off Wednesday, April 2, 2014, with Light It Up Blue! This unique initiatives kicks off Autism Awareness Month. 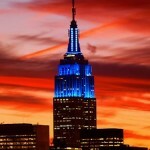 Iconic landmarks will be lit up blue for World Autism Awareness Day. — Changing your Facebook and Twitter profile pictures to blue! You can download a blue filter, Twibbon, or banner. — Wearing blue and ask friends, family, and coworkers to wear blue too! Post photos on Facebook or Twitter using #LIUB. — Changing your outdoor lights to blue and encourage local businesses to do the same! 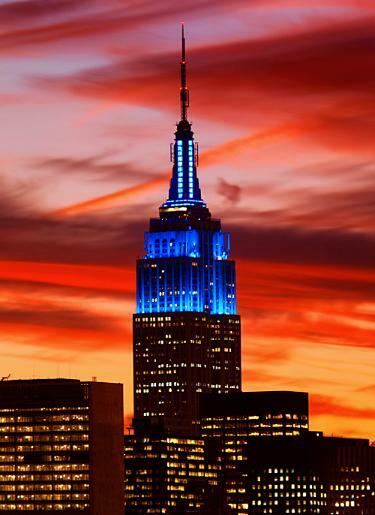 See photos of iconic buildings that are lit up blue. For more information on autism, please contact Illinois State University’s Autism Spectrum Institute. You can also show your support by, you know, educating yourself about Autism and how people with Autism want you to support them. "Wearing blue" doesn't really do a lot.